“Have you ever seen a ghost,” my friend asked. We were having breakfast at Cafe Dewitt. I was on the banquette with my back to the fishtank. We were early so no one was seated nearby but they would have been intrigued. My grandparents lived in a tiny rural community in southwestern Virginia called Rural Retreat. My grandfather was a carpenter who had built many of the houses in the town, as well as much of his own. He was a leader in the tiny circuit rider Methodist church, a dour man who did not drink or hold with dancing, fiddle playing, or working on Sunday. He was awkward with his granddaughters but he always had a box of Hershey bars in the pie safe for us when we came and would call us in the afternoon to drink grape juice he had canned. When he died, I flew from D.C. for the funeral, bringing my 18 month-old son. When I arrived, the house was filled with people – in the parlor, in the dining room, and in the room we called The House where my grandfather was laid out in an open casket. The kitchen and dining room tables were laden with food and the women were washing dishes, opening containers, and replenishing plates. My son was whisked away and passed from hand to hand. I was given lunch and told to sit. Over the course of the afternoon people came and went and by evening there was only the close family left, sitting around the kitchen table. My grandmother went to bed but we lingered and raided the fridge. Then we began to think about going upstairs, too, but we wondered what to do about the open casket. The house had mice. There were mouse traps in the pie safes and wooden lids over the flour drawers, so the question was real. We could close the casket, of course, but we did not know how it worked. There might be a latch of some kind and then we wouldn’t be able to open it in the morning and that might upset my grandmother. But leaving it open was not an option. We thought of calling the funeral home director but it was late. Finally my aunt just went in and closed it and we all went up to bed. The house got dark and quiet. I sat in bed writing in my journal by the light from the walk-in closet. The wind was blowing hard, making wailing sounds I was accustomed to. I had learned to love thunderstorms here, watching lightening flash behind the next hill. Part of my mind wrote, while another part listened to the rise and fall of sound outside the black windows. Gradually the part of me that was listening became aware of another sound that was not the wind and was not the old house responding to the wind. At first I paid no attention because it was also a sound I was accustomed to – a measured sound, that moved around on the main floor. At last my common sense rebelled. I stopped writing and listened and began calculating what the sound could be. My light was the only light. No one was awake. And yet someone was walking downstairs. I considered this and decided it was my grandfather. He had lived 60 years in the house and we were going to bury him the next day. He had a right. I turned off my light and went to sleep. 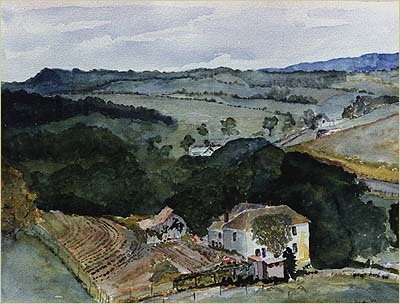 Watercolor, by my mother, looking down on the house from the top of the next hill. I don’t think I should say I have always wanted to see a ghost. There are plenty of ghosts that I have no interest in seeing because I might get more than I bargained for. I should just say “I have not seen a ghost, but I think I heard one once.” And leave it at that. You are currently reading Country Funeral at Susan R. Dixon.